Afterwards, Manda, myself and Robert - one of the Aussies - took a walk back to Aya Sofia to get some more pictures (our last stop had been somewhat brief). Pictures over, we then headed back towards the Grand Bazaar with a brief detour at a bank to change money (where, incidentally, the teller completely failed to understand my pigeon Turkish and resorted to the little English that he knew). The Grand Bazaar is not called that for nothing. It's huge. Every route you take there are side routes and off those are more side routes. It's quite a maze. There are streets/aisles/lanes (not sure how best to describe them) that have specialised areas, like leather lane or gold lane. Generally speaking, though, you can see the same things throughout. And outside every shop sits the owner trying to assess what country you are from and coming up with the best line to entice you in. The best one I heard was so simple: "You are looking for me - I need money. You can help me!" We didn't though. Instead, we continued on to a tea shop and helped ourselves to Turkish and apple teas. Point to remember - try the apple tea before putting sugar in. You may well not need that extra sugary sweetness! We then tried to get our bearings in this maze to head out towards north in the direction of the Süleymaniye mosque. This is the largest of the mosques in Istanbul, but evidently not the easiest to find. Despite having huge minarets, it's very difficult to spot when you are at street level. It's obvious from a distance, but when you are right next to it, you could walk all the way around it and not know it's there. Believe me, this is eminently possible. We pretty much did just that! 1 hour or so after trying to find the mosque, and very exhausted thanks to the afternoon heat, we finally got there just in time for the 5pm call to prayer. When the call to prayer happens, the whole city seems to buzz. From this location at the top of the hill overlooking the Golden Horn, we could hear this general din in the distance as all the other minarets throughout the city filled with the wailing renditions of the Koran. Some might compare it to the sound of a strangled cat, but if you take a break from Westernised preconceptions and just listen to the voice, you can hear that it is often pitch-perfect - it's just a musical scale that is different to what we are used to. We then got a taxi - or taksi - back to the hotel. Luckily, we had a card from the hotel which showed the location. This made it easier for the driver, and just to be sure that he didn't attempt to take us on another trip around the city - heck, we'd almost done that ourselves on foot - I kept a map open to make it appear as if I was checking his route with the desired route. Truth was I hadn't a clue. He didn't know that though! We got back without being ripped off. Result! We finished off the day with a group meal at a place called The Olympiat. It's in the fish district of town known as Kumkapi, and our meals were largely based around this. I opted for a bluefish (lüfer), Manda had sea bass. I even braved the anchovies that were provided as starters ... And found them delicious, much to my surprise (I had always regarded them as 'those stinky things that ruin an otherwise perfectly good pizza'). 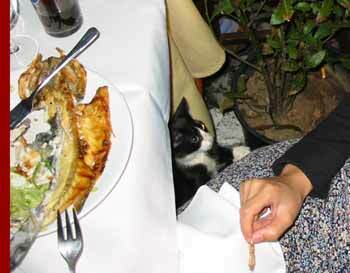 We were also joined by a group of cats who also seemed to want a bit of fish and a group of musicians who played traditional Turkish songs (including the recent Turkish hit 'Kiss Kiss' which Holly Valance did a cover of. Yes, it was a Turkish song first, folks). The cats were dismissed with either a piece of fish (or a push/kick/whatever), the musicians with tips. They were good though. 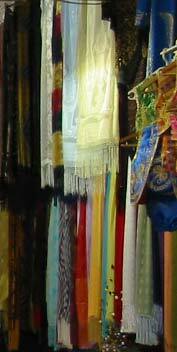 Shawls for sale in the Grand Bazaar, Istanbul.